Variety – the Children’s Charity and Global BC are excited to announce that this year’s entertainment line-up for the 53rd Annual Variety Show of Hearts Telethon will include actor, author and social activist, George Takei. 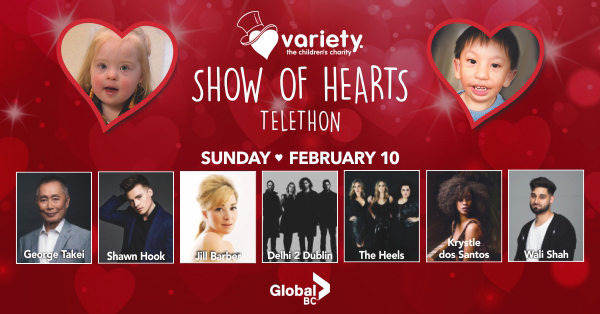 The Variety Show of Hearts Telethon will air on Sunday, February 10 from 9:30am to 5:30pm on Global BC and via livestream at GlobalNews.ca. The public is also invited to come down to the Molson Canadian Theatre at Hard Rock Casino Vancouver where they can join in on the fun and excitement as an audience member. Best known for his portrayal of “Mr. Sulu” on the acclaimed television and film series, Star Trek, George recently joined the cast of AMC’s anthology series, The Terror where he also serves as a consultant. He has earned a Grammy nomination with his Star Trek co-star, Leonard Nimoy in the “Best Spoken Word or Non-Musical Recording” category and has received a star on the Hollywood Walk of Fame. A dynamic and powerful public speaker, George has become a favourite at the WE Day events across North America. He has also written four books including his 1994 autobiography, To the Stars. Joining George will be singer-songwriter Shawn Hook whose 2015 single, “Sound of Your Heart” reached #1 on Billboard’s Dance Club Songs chart and went on to be certified Double Platinum. Additionally, his 2017 single, “Reminding Me” – a ballad featuring Vanessa Hudgens – peaked at #3 onBillboard’s Hot AC chart and has logged more than 100 million streams on Spotify. Shawn has made numerous television appearances including Live! With Kelly, Jimmy Kimmel Live and Today. Also appearing will be singer Jill Barber, country music trio The Heels and world music group Delhi 2 Dublin. A two-time Juno Award nominee, Jill’s albums have sold over 100,000 copies including 2011’sMischievous Moon which spent thirteen consecutive weeks at #1 on the Canadian Jazz chart and debuted in the US at #12 on Billboard’s Jazz chart. The Heels – who earned a BCCMA Award in 2016 – recently released their debut album, Love, Heels while Delhi 2 Dublin – who have performed their uniquely eclectic mix of Bhangra, Celtic and modern electronic at some of the biggest music festivals worldwide – released their new single, “Home (Everywhere I Go)” just last month. Rounding out the line-up will be spoken word poet and public speaker, Wali Shah who has reached audiences throughout the world including at WE Day and singer Krystle Dos Santos who has made a name for herself on the local scene by combining original soul music with beloved Motown classics made famous by such legends as Aretha Franklin, Stevie Wonder and The Supremes. This year’s hosts will include Global BC’s Chris Gailus & Sophie Lui, CKNW’s Lynda Steele & Niki Reitmayer and CFOX’s Karen Khunkhun along with Variety kids, Bryan Hu and 2018 Variety Red Heart Award Winner, Esabella Strickland. The eight-hour telecast will also feature children who Variety has helped as well as updates on the families introduced during last October’s Variety Week. Donations to the Variety Show of Hearts Telethon can be made by calling toll-free at 310-KIDS and also online at variety.bc.ca or by texting “KIDS” to 45678 to make an automatic $20 contribution.